•Have a patch test prior to every treatment to ensure that you don’t have a reaction that could take time to recover from and cause long term complications like blemishes or a rash that will affect your photos and confidence. •Waxing or shaving should be completed at least 24 hours prior to the treatment. Reschedule/forego your treatment if you cut yourself badly while shaving or if you lose any skin during waxing. Not only is it potentially unsafe to apply self tanning products to broken skin, but the finish will be “off” around the edges of the damaged skin. Better to wait and reschedule when your skin is healed. •The evening before your sunless tanning treatment, exfoliate your entire body in the shower with a hydrating scrub and moisturize well. Pay special attention to dry areas of your body such as hands, elbows, knees and feet that can absorb more product at the surface and stain or flake off. That thin layer of moisturizer after exfoliating is so key! •Wear dark, loose fitting or flowy clothing in a natural fiber like cotton so that you don’t stain your clothes. Also go the extra mile and wear dark colored underwear, since many treatments contain a guide color/bronzer that may stain man-made fibers like nylon or delicates like silk. •Spray products can stain light and processed (bleached) hair. If you are going for a professional spray tan and have light blonde hair, you will want to slick your hair back with pomade or a leave in conditioner and similarly coat the ends before putting it up in a high bun away from your neck and shoulders to avoid staining. •Have a trial run a few months before the wedding. You can’t afford to be trying something for the first time in a small timeframe if it goes awry, because those photos are forever! Are you pale and proud or seeking the sun? Sunless tanners are so much safer than UV exposure! •Remain still, don’t bend or drastically move immediately after application to allow solution to dry completely. •Be strategic and think of your body in terms of zones (arms, legs, torso, etc) and apply self tanner to one zone at a time to help prevent streakiness. •Apply extra layers and pay special attention to calves and thighs or any other area where skin may be thicker, as these areas will not absorb as quickly, but be sure to use a light hand and build, then blend like crazy as you near ankles, knees, and backs of knees. •For a streak free application, control your ambient temperature and never apply in a steamy, hot bathroom or on an extremely humid day. •Reapply a light coat after 24 hours if you desire a deeper darker tan. •Apply the tanner to your body with a sponge or mitt in circular motions. This allows the tanner to go on evenly and blends away streaks. •Aerosol can options can be a good option for a novice because the fine mist makes them easy to apply and blend using a mitt, sponge, or your hands (just be sure to wash your hands afterwards). You can also spray aerosol formulas onto a makeup sponge and apply to your gently exfoliated & well hydrated face with circular motions. •If you have sensitive, oily, or acne prone skin do yourself the favor and use sunless tanners formulated specifically for the face, which usually contain fewer oils and won’t encourage blemishes. •DON’T OVER DO IT. Wait for your color to develop before you start slathering on multiple layers of self tanner, and if you are fair skinned start off with a Light product and work your way up to a deeper tan. If you layer up too much too soon, you run the risk of developing into Oompa Loompa orange. Don’t try too fast for a dark tan and wind up an orange that is shocking to behold. •All of the above tips regarding pre-tan skin prep apply. •You are not a car, so don’t go for the automatic spray booth detailing job. 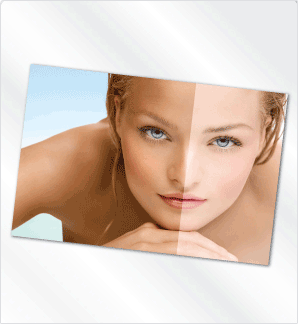 For the most foolproof results, splurge on a sunless tan administered by an experienced airbrush technician. Your results will be more even and realistic. •Remain still, don’t bend or drastically move immediately after application to allow solution to dry completely. Follow all aftercare guidelines provided by your technician. •Do not swim, run, do yoga, or participate in activity which may cause perspiration for at least 12 hours after the treatment, lest you sweat your tan off before it has had time to set. •Products that contain a guide color (a bronzer so that you can see where you have already applied product) may transfer onto clothing and bed linens. These tints will generally wash out of cotton but not so easily from man-made fibers or silk and wool, so plan accordingly. Try to stay cool overnight to prevent sweating off your color. Use darker colored or old sheets, and keep a Shout-like stain spray like this cruelty free one from Seventh Generation on hand in case there is any color transfer so you can easily spray any stains, strip the bed, and not worry about ruined bedding. •Apply moisturizer daily. Keeping your skin moisturized is key to protecting the longevity of your sunless tan; for an added color boost, try a gradual self tanning formula. •Quick touch-up is easy with disposable wipes like Dr. Dennis Gross Alpha-Beta Glow Pads, SoniaKashuk Sunless Tan Golden Tanning Towelette or those from Tan Towel. They’re super easy to use, and the individually wrapped towels are portable and convenient to keep your glow on the go. Great for vacations and destination weddings. And of course, let your makeup artist know that you plan to tan. Best case scenario, you do your tan trial run right before your makeup trial so that your artist can calibrate your colors to your bronzier hue and you get the clearest picture of what you will look like day of. Stay tuned as I begin the perilous journey (gulp) into the world of self tanners to report on which cruelty free ones work best.